-Rupp put some manners on him. -Should be interesting to see how these new lines work tonight. -Talbot with another great chance but DiPietro stops it with a circus save. Conner unable to put home a golden rebound, defenseman just tipped the shot wide. -Puck bounces off back boards to Grabner but Johnson gets the pads down to stop him. A few assorted chances so far but neither team sustaining pressure. -Talbot and Conner again hook up for a chance but 25's pass just a bit wide of Conner's stick. -Talbot flattens Comeau into the boards. Comeau slow to get up so play stops. Clean hit, don't let anybody tell you otherwise. Konopka jumps in and gets himself an extra 2 for roughing. -Tangradi with some nice speed to get himself a good opportunity on DiPietro. Adams just missed a rebound chance. Pens buzzing on all cylinders right now. -DiPietro with a spectacular save on Chris Conner set up by some solid checking by Rupp. -Godard to the box. Pens kill the penalty like they usually do. Puck up and down the ice. -Tangradi is getting time on several different lines (as Bylsma planned). -Johnson with a solid glove save on Parenteau. Probably the best opportunity of the night for the Isles. -Isles get a late powerplay. It will carry over into the 2nd. Notes: This is exactly how a period should look against the Islanders. No complaints here, just keep it going. -Isles start period on a powerplay. Pens dominate possession on a PK. -Talbot with a shorthanded chance set up by Cooke. Hits both posts, goal horn at CEC goes off, but still no goal for him. -Rupp and Konopka square off. Rupp lands a few great shots early and then a few more late before wrestling Konopka to the ground. -Game picking up some pace. Islanders really pushing for some offense but Johnson and the D not budging. -Comeau got Letang pretty hard from behind. Letang looked like he was hurt for a while but got up and rejoined the play no worse for wear. This one getting a bit ugly at the moment. -Pens to the powerplay. A goal here would be devastating for the Islanders. 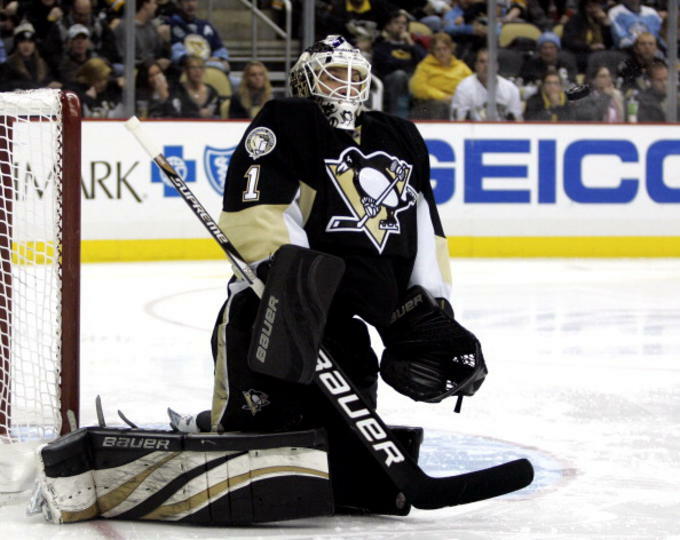 -Countless chances for the Pens on that man advantage but they just couldn't seem to hit the net. Tangradi also received significant PP time. -Hard work by all Pens forwards right now. Pens get another powerplay. -Kunitz clangs one off the goalpost while flying into the zone. Great pass from Jeffrey. -Powerplay ends with a Staal interference call. Time for some 4 on 4. 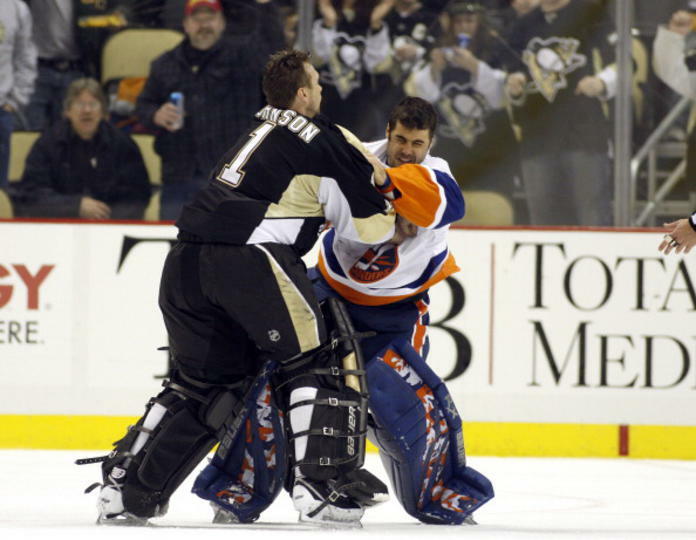 -Pens again generate more attack on the Isles' PP than the Isles do! -Rupp to the box for a late hit. Saw the ref waive off what he thought was the icing but it turned out to be something else. Fluky penalty. -Bizarre moment here. Adams with a nice shorthanded chance that bounces off DiPietro's glove, onto the top of the netting and into DiPietro's water bottle holder. Notes: This game could easily be about 5 or 6 to nothing right now. Pens hit 3 posts and had a few more where DiPietro was just plain lucky. Hopefully those missed chances won't come back to haunt us but if we keep playing like this than we'll be fine. -After penalty expires the Isles get a nice rebound off Johnson but he recovers in time to clear his crease. -Lines are jumbled to start the period. Jeffrey with Rupp and Adams. Tangradi with Talbot and Conner. -Pens powerplay. Grabner looked sure to get a shorthanded breakaway but fantastic diving play by Michalek to strip him. -Pens in "lead protection" mode. So far Johnson and the defense are stepping up to the plate. -Johnson with a great glove save near the midway mark in the period. Even more impressive considering the deflection right before it got to him. -The only thing concerning me now is that the Pens have forgotten about offense. All Islanders right now. -Still 2-0 with 5 minutes to go. Much of the same so far in the third. -And some more PK awesomeness. -Cooke with a chance to end it but DiPietro gets in front of it at the last moment to keep the game within 2. 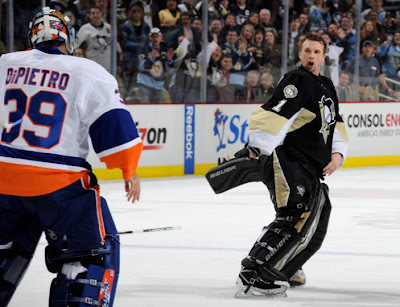 -Islanders pull the goalie early, Pens hold the fort. -After setting up Talbot for a whole minute, he finally launches one from center ice AND IN! It's about time! 3-0 Pens. -CHAOS! 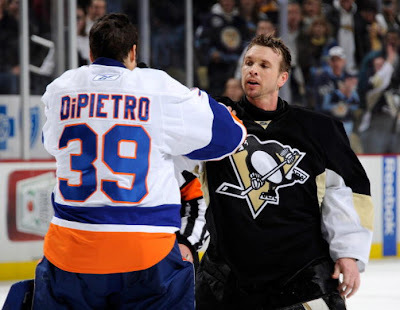 DiPietro takes a cheap shot on Cooke. Fighting in the boards and who comes to Cookie's defense. BRENT JOHNSON. GOALIE FIGHT!! PUMMELS Ricky with one punch. -Fleury and Poulin out to finish the last 16.5 seconds. -Pens actually had a powerplay and tried to score at the end but it doesn't matter! -PENS WIN 3-0 in a CRAZY ending. Notes: That was unreal. Brent Johnson for President! -Ah, what the hell! Johnson can be vice president too! -On a more serious note, also a great showing for the D.
-Zbynek Michalek is worth every penny. -Tangradi looked like a solid NHL 3rd line grinder. Doing work in front of the net and dishing the puck off nicely. -Max Talbot played a whale of a game. 2 posts away from a hat trick. -Pens really played "smart" hockey today as well. Can't think of one instance where they made things more difficult on themselves. Coaching 101: Take what your opponent gives you and build on it. -Underrated player of the game: Chris Conner. Didn't show up on the scoreboard but he was absolutely flying out there! 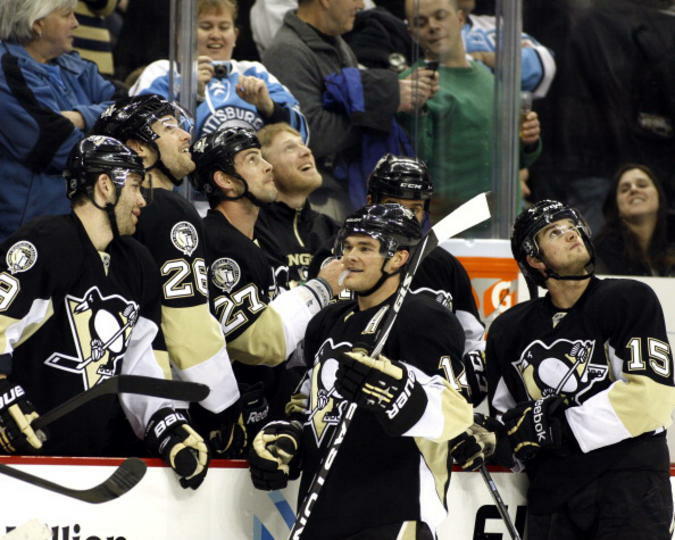 Kunitz's goal was really hard on the Isles, especially with the way the Pens' D was playing.